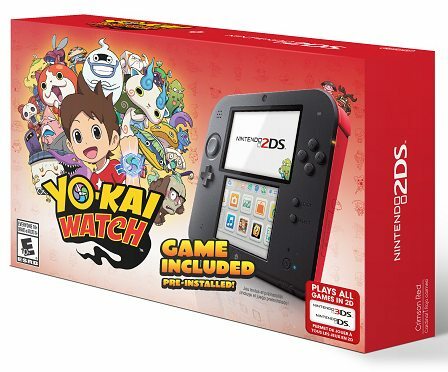 Nintendo of America has shared plans to release a new Nintendo 2DS bundle to coincide with the Yo-kai Watch‘s launch. Priced at $99.99, this will include a pre-installed version of LEVEL-5’s JRPG phenomenon on a Nintendo 2DS system, which, for those that need a reminder, can play Nintendo 3DS and Nintendo DS games in 2D. It’s the perfect entry point for those yet to invest in Nintendo’s latest family of handheld systems, and marks a concerted effort to help make Yo-kai Watch a smash hit in the west. Those curious about the JRPG can try a free demo, which will be available in the Nintendo eShop on October 22nd. Yo-kai Watch will release exclusively for Nintendo 3DS on November 6th in North America, December 5th in Australia and New Zealand, with Europe to follow in 2016.